The Pittsburgh Penguins were able to get some injury reinforcements back in the lineup as Evgeni Malkin and Bryan Rust were able to return from injury, but they weren't able to bring back the player they needed the most. Marc-Andre Fleury missed another game with a concussion, and again the Penguins struggled trying to overcompensate for Zatkoff. This time, the Rangers got the result their gameplay deserved as they took down Pittsburgh 4-2. Phil Kessel scored both the goals for the Penguins, but the team will need to reassess their strategy as the series moves to New York Tuesday. The refs were a bit quick with the whistles in Game 1, bu they seemed content to put them away early in this one and allow things to get chippy. The Rangers tripped Chris Kunitz in the opening minutes to prevent a scoring chance, but there was no call on the play. Evgeni Malkin was back after missing the previous 16 games with injury, and he nearly got on the scoresheet early when he fed Kris Letang on a give-and-go, but Henrik Lundqvist was able to make the save. Jeff Zatkoff would get tested moments later when Derek Stepan was sprung on a breakaway, but Zatkoff was able to stand tall and shrug the shot aside. The teams played close much of the 1st period, but Pittsburgh would start gaining the upper hand in play. Kevin Hayes got called for interference late in the period when Kevin Hayes shoved Patric Hornqvist down in the corner of the Pittsburgh zone. The Pens would have a great chance early on the power play when Hornqvist got behind the defense, but his initial shot hit Lundqvist's shoulder and his rebound attempt sailed over the crossbar. 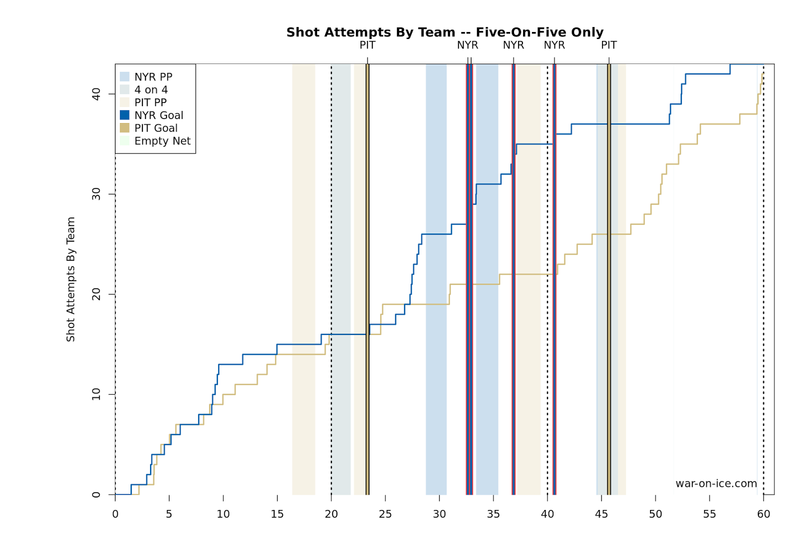 It would be the closest Pittsburgh would get to scoring as the Rangers did a good job shutting things down on the kill. Sidney Crosby would nearly beat Lundqvist on a shot from the slot in the final minute, but the netminder got just enough of it to redirect it into the glass behind the net. Hornqvist and Mats Zuccarello would pick up coincidental roughing minors with 1.5 seconds left on the clock after a net front scrum in the New York end, and the teams would head into the first intermission still scoreless. The teams would start the 2nd period playing 4-on-4, and Rick Nash would take advantage of the extra space to get a breakaway right off the opening faceoff, but Zatkoff would turn his backhand attempt away. Shortly after the teams returned to even strength, Conor Sheary would draw a hooking penalty from Mats Zuccarello to give Pittsburgh their second power play of the game, and it would be a tremendous series of events that would lead to the Penguins opening the scoring. Eric Staal would take the puck in alone on Kris Letang, and after managing to shake the Pittsburgh defenseman along the right boards he created a 2-on-1 chance for the Rangers. But Patric Hornqvist was able to backcheck and make a sliding stick check to knock the puck away. Nick Bonino grabbed the puck and brought it up the ice, and he made a turning cross ice pass to Trevor Daley who, with Lundqvist pushing hard to the far post, dropped the puck off to Phil Kessel, who was able to fire the puck into the empty cage to make it 1-0 Pittsburgh. New York would get its first power play of the game and a chance to tie the score when Brian Dumoulin was sent off for hooking J.T. Miller, but they had difficulty getting set up and the Pens were able to prevent turn aside the Rangers' man advantage. They would nearly go on to score when Dumoulin left the box to create an odd-man rush, but Lundqvist would make a couple big saves to keep the deficit to one, first off Olli Maatta then after Kunitz slapped the rebound back on net. Lundqvist was keeping the Rangers in the game, and it paid off later in the period. The Rangers won an offensive zone faceoff, and Miller found Keith Yandle driving the slot on the far post to tie the game 1-1. Just 18 seconds later, Maatta would misplay a bouncing puck in the neutral zone, and Derick Brassard would collect the loose puck and wrist it past Zatkoff to give the Rangers a stunning 2-1 lead. The play would be reviewed, and despite the replay appearing to show Brassard's skate fully across the line before the puck, the refs would uphold the on-ice call and awarded the goal. To make matters worse for the Pens, Bryan Rust would be called for interference on Marc Staal seconds later to put the Rangers on the power play with all the momentum in the world. Crosby found Rust exiting the penalty box all alone behind the New York defense for a breakaway, but he couldn't beat Lundqvist to tie it. It would prove to be another huge stop for the Rangers, as shortly after Miller threaded a pass cross ice to Zuccarello, and he was able snap it into the net before Zatkoff was able to get over. The Pens would get another power play at the end of the period when Miller interfered with Tom Kuhnhackl, but the Penguins again couldn't find the back of the net with the man advantage and New York took the 3-1 lead into the second intermission. The Penguins would need a strong start to the 3rd period, but it was the Rangers getting the next goal just 39 seconds in when Trevor Daley turned the puck over in the slot, and Kreider's shot went off a sliding Daley going for the block and behind Zatkoff to extend the lead to 4-1 New York. 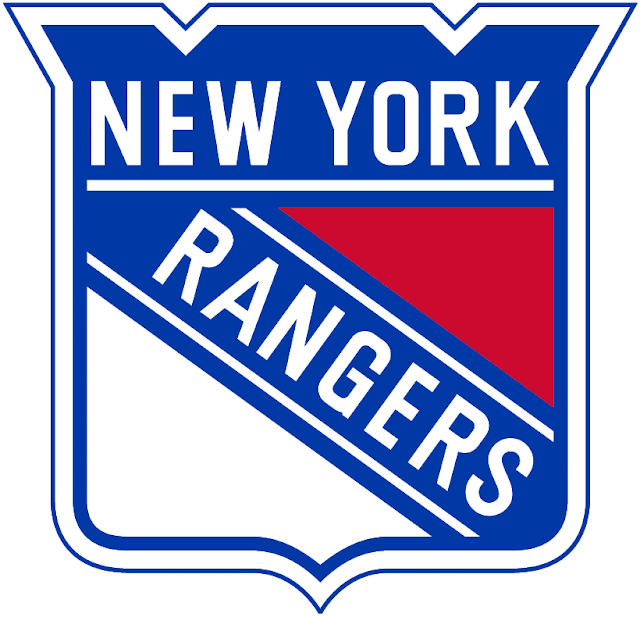 The Rangers would momentarily have a power play after Crosby was called for hooking on Viktor Stalberg, but 7 seconds into the opportunity Kreider would be sent off as well for goaltender interference. Midway through the 4-on-4, Malkin was able to draw a cross-checking penalty from Yandle, and Pittsburgh quickly took advantage of the 4-on-3. Off the faceoff, Malkin would get the puck and feed Bonino on the right post, who would make another spinning setup for Kessel on the far post, and Phil Kessel would get his 2nd goal of the game firing the puck into a vacated net. The goal seemed to reinvigorate the Penguins, and they started ramping up the aggression and driving the play into the Rangers' zone. The refs would continue to let the game spiral hopelessly and dangerously out of control. Ben Lovejoy boarded Stepan in the corner on a hit that left the Ranger momentarily motionless on the ice, and while it easily could have justified a 5 minute major and game misconduct nothing was called. Marc Staal and Kunitz would get into it behind the New York net, leading to Kevin Klein feeling the need to drop his gloves for his partner, but the refs would give both a minor, Kunitz for slashing and Klein for unsportsmanlike conduct, in addition to 5 minutes for fighting. For a second game in a row, the Penguins were a dud in driving play against the worst possession team still alive. The team has thoroughly overreacted to losing both their top goalies, and it showed again as they managed only a score-adjusted 43.3 CF%. It's an alarming trend for a team that had been one of the best in the league since Mike Sullivan took over, and it appears to be largely self-inflicted. Regardless, the Pens have given up home-ice advantage and will travel to New York needing to get their game back on track.